My sister visited me for 8 days so I didn't get much work done, and missed my weekly plein air session altogether. Fitting in a half hour here and there, I painted the squash leaves for a second time. On this go round, I used a limited palette of only 5 colors: viridian, Winsor green (yellow shade), green gold, perylene green and brown madder. I put a great deal more detail on the leaves, though it doesn't all show up well in the photo here. 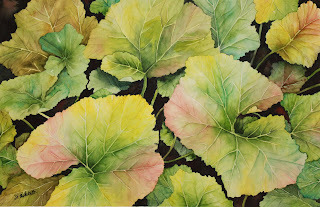 The terre verte I used on the first painting behaves very oddly-almost sits on the surface of the paper, but it did give a luminous, almost iridescent character to the leaves. This one doesn't have as much of a 3 dimensional quality as the earlier piece, but I like it better-the painting just has more life to it. This is the painting I plan to enter in the SCVWS "Anything Goes" exhibit at the Norton Gallery in Palo Alto. Awesome! I think it has a lot of depth! Janice this painting is fantastic and even more superb in person. I'm glad you are planning to enter it into the exhibit. Thank You for the wonderful lunch and day of painting! You are a talented Artist, Chef, and have a Beautiful home. David is so Lucky!! Janice, Sorry Flo and I kept you from your painting. It was too hot for plein air painting anyway. I agree the squash leaves look better in person. Good luck with the SCVWCS thingy. I just love this one.The colors and depth are terriffic. Way better than the photo. IT IS the clear choice for the show!! I rushed last night to produce a painting last minute!! Sorry to miss the great painting luncheon when I was in Iowa. See you soon!! One day I'll make the SCVWS Plein air thing. Janice, you are unique. Stop putting your self down. Ann-She just doesn't get it-my comments are about my painting process-not a "put down!" In fact, I said that I like the picture.